Our Purpose is to help provide interest and awareness in the arts for the children and youth of our community while providing support to the Corry Area Arts Council. Provide Matching funds with the School District with Partners in the Arts Residency Programs. Sponsor a week-long summer residency in music and drama with the Missoula Children's Theatre. Assist the music and art departments of area schools in their areas of need. 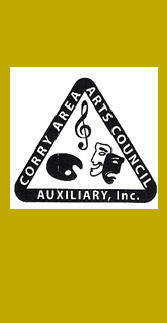 Give opportunity for youth to perform at Corry Arts Council and Auxiliary events. Give scholarships at graduation to seniors going into Art and Music. All the above are offered to students attending Corry Area Schools, Corry Alliance Academy, St Thomas School and Home School and Cyber School Students. 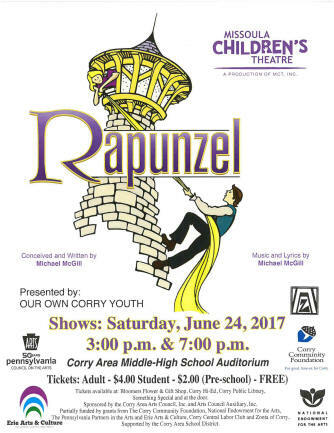 Corry Arts Council Auxiliary, Inc.